Gholam Ali Khoshrou, Iranian Ambassador to the United Nations, urged the UNSC to condemn the "irresponsible remarks" made by the Moshe Ya'alon earlier this month in Jerusalem. "Ya'alon's recent remarks and the Zionist official's implied reference to the possibility of using nuclear weapons against the Islamic Republic like what happened in Hiroshima and Nagasaki and also his threats against the Lebanese civilians, including the women and children, shows more than ever the regime's aggressive nature," Khoshrou stated in a letter to UN Secretary-General Ban Ki-moon and Lithuanian Ambassador Raimonda Murmokaite. According to Khoshrou, the Israeli minister's "impudent remarks have challenged the primary principles ruling the armed conflicts and the international humanitarian rights and weaken the international peace and security," the semi-official Fars news agency reported. The Iranian ambassador has called on the UNSC to censure the “clear threats of using nuclear bomb and massacre of civilians." The minister has further stated that “in certain cases we might take certain steps that we believe…should be taken in order to defend ourselves. “We are not there yet,” Ya’alon said. Although Israel has never publicly admitted to having a nuclear arsenal, maintaining the so-called policy of ‘nuclear ambiguity’ regarding its alleged stocks of nuclear weapons, it is widely believed to be the only power in the region to possess the atomic bomb. Meanwhile, a top military adviser to Iranian Supreme Leader Ayatollah Ali Khamenei warned on Wednesday that should Israel attack the Islamic Republic "over 80,000 [Iranian] missiles are ready to rain down on Tel Aviv and Haifa." "The Zionists and the US are aware of the power of Iran and Hezbollah," Major General Yahya Rahim Safavi stated, referring to Ya'alon's comments, adding that “Iran is a powerful country which will give a crushing response to them." The top military advisor said that similar remarks made by the US and Israeli officials are only meant to serve as a ploy, Fars reported. "We have displayed part of our military capabilities while we have kept many of our achievements and capabilities hidden to outsiders; our response will be crushing not just to the Zionist regime, but to any other aggressor who intends to take action against us," he hit back. Last month Iran and international powers reached “solutions on key parameters” of Tehran’s controversial nuclear program. During the media conference in Switzerland, EU foreign policy chief Federica Mogherini said the deal created the basis of a future comprehensive nuclear agreement between Iran and six powers to be concluded by a June 30 deadline. The group of countries known as ‘P5+1’ (the US, Russia, China, Britain, France and Germany) have been trying hammer out an accord with Iran to restrict the country’s nuclear program in return for a lifting the economic blockade imposed by the UN for nearly 18 months. The agreement envisages the Fordow facility being converted into a nuclear physics center with no fissile material. It was agreed that the Natantz facility would remain as the only uranium enrichment complex in the country. 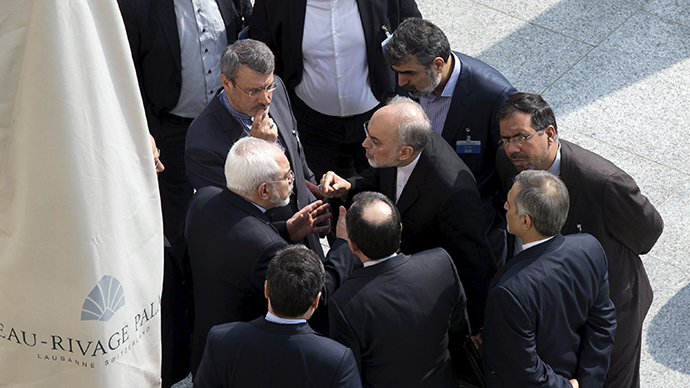 Under the deal Tehran was obliged to refrain from creating nuclear weapons. The US and EU are to lift Iran all nuclear-related economic and financial sanctions after the signing of the deal, on June 30, and after IAEA verification. According to the Russian Foreign Ministry Sergey Lavrov, the deal could help the security situation in the Middle East, with Tehran taking a more active part in attempts to solve conflicts in the region. Israeli Prime Minister Benjamin Netanyahu has fiercely opposed a nuclear Tehran, however, by attempting to coerce Washington into impeding the diplomatic solution offered by the P5+1 negotiations. Following his visit to Washington in March, 47 Republican senators signed a letter written by Arkansas Senator Tom Cotton, which threatened to pull any nuclear deal reached with Iran, once President Barack Obama leaves office. Earlier this month the House of Representatives has passed a compromise bill that will give Congress review powers over the Iran nuclear deal, within limits agreed to by the White House, however.